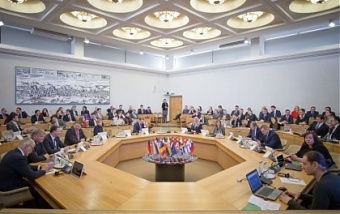 The Investors' Forum, an association of foreign investors in Lithuania, has put forward 100 proposals to the government on how to improve the business environment in the country, informs LETA/BNS. "We may see different ways to achieve it, but we have a common goal of achieving that we are not where we are today," Prime Minister Saulius Skvernelis said after a meeting with investors on Monday. Skvernelis said that around 50 of the proposals were already in the government's plans and the rest would be analyzed. Rolandas Valiunas, chairman of the board at the Investors' Forum, said that the most contentious issue between the government and the association was opening direct air links between Vilnius and Europe's key capitals. "We probably agree with the prime minister on 90 percent of issues, and airlines are perhaps an issue on which we don't agree dramatically. We think that financing flights could be a great temporary measure," he said. Skvernelis said in response that Lithuania was not free to finance air transport under EU regulations. The association listed the top ten proposals, including placing a ceiling of four average salaries on payments to the state social insurance fund Sodra, ensuring direct air transport between Vilnius and key European cities, encouraging Lithuanian emigrants to return to their homeland, attracting skilled labor and talent, improving the quality of public sector services, and listing a part of large state-owned companies on the stock exchange.